STEPHEN VARCOE is one of Britain’s most distinguished baritones, especially acclaimed in the field of Baroque music and in the song repertoire. 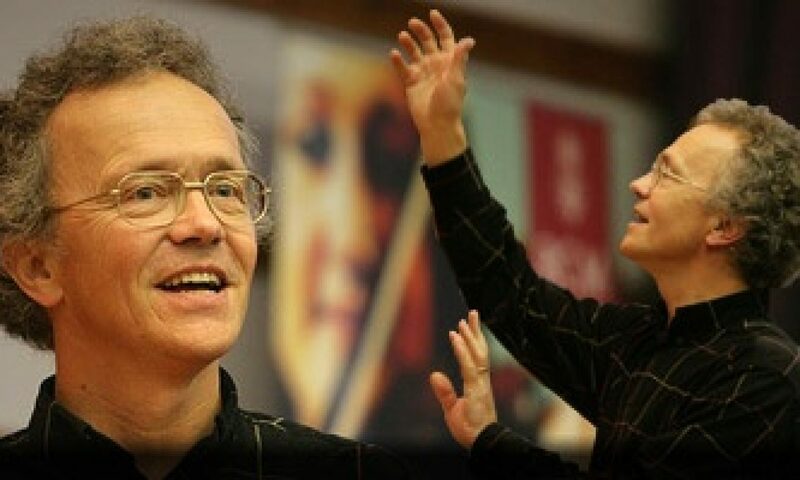 He has made about 150 recordings, collaborating with John Eliot Gardiner for Philips, Erato and DG Archiv on discs of Purcell, Handel and Bach, and has joined Richard Hickox for numerous releases of Haydn, Beethoven, Vaughan Williams, Grainger and Britten on Chandos. His musically fruitful relationship with Hyperion Records has produced many fine recital discs, from the romantic and sensuous French songs of Hahn, Chabrier and Fauré with Graham Johnson to the quintessentially English Finzi, Gurney, Parry, Stanford and Armstrong Gibbs with Clifford Benson and Roger Vignoles. With Graham Johnson, Stephen was the second artist after Dame Janet Baker to be invited to interpret Schubert for the celebrated complete Hyperion series. His versatility also encompasses recordings of twentieth century works by Stravinsky, Schoenberg, Nigel Osborne, Thea Musgrave and John Tavener. On the concert platform, in a career spanning more than three decades, Stephen has appeared with orchestras all over the world. Highlights include Stravinsky’s Abraham and Isaac in New York with Robert Craft, Stravinsky’s Threni in London with Rozhdestvensky, Holst’s Savitri in Amsterdam with Hickox, C P E Bach’s Die Israeliten in der Wüste in Cologne with Christie, Bach’s Mass in B Minor in Italy with Rifkin, Haydn’s Creation in Lisbon with Brüggen, Handel’s Apollo and Daphne in Versailles with Minkowski, the centenary performance of Fauré’s Requiem in Paris with Tortelier, and the fortieth anniversary performance of Britten’s War Requiem in Coventry with Cleobury. He has regularly taken part in the BBC Proms and international festivals, and appeared in recital with some of our finest accompanists, particularly Graham Johnson, Iain Burnside, Julius Drake and Roger Vignoles. His operatic appearances include Haydn’s L’Infedelta Delusa in Antwerp with Kuijken, Debussy’s Fall Of The House Of Usher in Lisbon and London, Tavener’s Mary Of Egypt in Snape, Rameau’s Les Boréades in Aix and Lyon with John Eliot Gardiner, Peri’s Euridice for Drottningholm, and Monteverdi’s Orfeo in Japan. His repertoire also includes Death in Holst’s Savitri, Demetrius in Britten’s A Midsummer Night’s Dream and Salieri in Rimsky Korsakov’s Mozart & Salieri. In 2006 he was heard in a BBC broadcast of Malcolm Arnold’s hitherto unperformed opera The Dancing Master. Stephen was in the original cast for Jonathan Miller’s ground-breaking staging of Bach’s St Matthew Passion and its subsequent television production, and revivals in the USA.